Can Pittsburgh rally for an NCAA Tournament berth? Jamie Dixon and the Pittsburgh Panthers really dug themselves in a big hole starting the 2011-12 hoops season 11-9 and losing their first seven games in conference. But they seem to have some life still in them as they have won their last three games to improve to 14-9. Can they rally to get an NCAA tournament bid if they do not win the Big East tournament? A big reason why the Panthers have been playing well of late has been the return of Tray Woodall. When their talent point guard is healthy, they have been 9-1, when he has been out they have been 5-6 while also going 0-2 when he has been hobbled on the court. Woodall has helped to make Ashton Gibbs better by taking some of the scoring load off of his back while helping to setting him up with his playmaking ability. He has been huge for them and if he stays healthy the rest of the season they can do very well down the stretch. 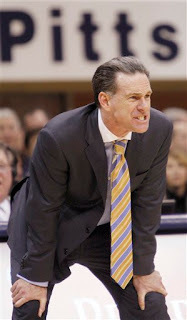 But Pitt does not have a huge margin for error over the final month of the season heading into the tournament. Just to get to .500 in conference they have to go at least 6-2 the rest of the way. Of their remaining schedule (vs. Villanova, at USF, at Seton Hall, vs. West Virginia, vs. USF, at Louisville, vs. St. John's and at UConn), the Panthers could definitely get six wins but it won't be easy. And even then a strong performance at MSG in the conference tournament could be needed to push them over the top to get to March Madness. But, as noted by the fine folks at The Dagger, the selection committee could take into account Woodall's absence. And they have played a strong schedule and their RPI is acceptable. It's going to take a lot for this team to rebound but by no means is it out of the question. But if they stumble, it is going to be conference title or bust.